A HISTORY of the club was compiled by former secretary Margaret Robinson after the West of Scotland Lawn Tennis Association requesting details for inclusion in a book published as part of the celebrations for the WSLTA’s centenary in 2004. It was initially published as an illustrated booklet, and this is an edited version prepared for the club website . . .
HELENSBURGH Lawn Tennis Club was established in 1884 at Suffolk Street on a field presented by ex-Provost Breingan. In 1911, this property was first conveyed from the Trustees of the late Alexander Breingan to Hew Tennent Young and Peter Lindsay Miller in their capacity as president and vice-president of HLTC. In 1921 the office of honorary president was first filled by Mr Hew T.Young, in appreciation of Mr Young’s services over the years 1884 to 1921. The constitution and election of officebearers were first recorded in the minutes in 1923. At HLTC’s formation, funding was raised in the form of debenture shares for founder members. The first recorded membership rates can be seen in the 1924 AGM letter to members and are: 55 Gentlemen @ £2, 112 Ladies @ £1.5/-, 21 Juniors @ 15/-, and 12 Non-playing @10/6. It is worth noting that there were twice as many lady members. Membership was fairly static until after the Second World War. The years from 1939-45 saw many HLTC members absent on active service during World War Two. At a committee meeting on 13th April 1943 it was recorded that there were only 10 gentlemen paying full subscription. Consequently the committee decided not to open the courts for play that year but to continue on a care and maintenance basis only. 1947 saw HLTC’s lowest membership numbers to date: 15 Gentlemen, 30 Ladies, 7 Junior, and 10 Non-playing. Again ladies outnumbered the men. At a committee meeting on 9th March 1947, liquidation issues were discussed. It was decided that a minimum membership of 90 was necessary for the club to be financially viable. However HLTC, like many other organisations at the time, was able to overcome the difficulties and continued to thrive. In 1953 membership status had increased to: 29 Gentlemen, 55 Ladies, 75 Juniors (with a waiting list), and 19 Non-playing. Until the more recent decades, lady members most definitely had the advantage over the gentlemen. The lady members, of whom there were usually double the number of gentlemen members, reaped the huge financial benefit of a lesser annual membership subscription than gentlemen. In addition many ladies in the mid-1900’s were not in full time employment and consequently were able to take advantage of the courts throughout week days, representing double value for money. It was not until 1954 that equal rates of subscriptions for both Gentlemen and Ladies was proposed. This was finally implemented in 1958. Ten years later a family membership was introduced. Today membership numbers have now more than doubled from the initial record of 200 to some 500 members, and today a senior member pays an annual subscription of £151. Held in the archives are two immaculately tabulated account books. The first book records accounts from 1913-1923 and the second book accounts from 1924-1945. Membership income has adequately financed the day-to-day operating of the club and has, for many years now, maintained a depreciation account. However membership income does not stretch to provide the additional funding necessary for development. The funding of large projects such as replacement clubhouses, new playing surfaces and floodlighting have all been major projects, and the sourcing of additional funds to execute development projects throughout the years has always been time consuming for the finance and development officebearers of the time. The first documented major project for HLTC involving finance and development was a replacement clubhouse, minuted initially in 1966. Sports grants and awards were difficult to source in these times. Application was made to the local Education Department. Part funding for this project was granted by the Education Department, leaving the club to source the outstanding balance of £2,100, which was a very substantial sum then. The solution to this problem arrived in the form of an anonymous benefactor who donated an interest free loan to the club, to be paid back in equal instalments over a ten-year period. 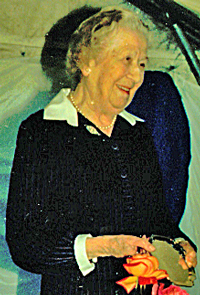 Development commenced and the new clubhouse was opened on 2nd May, 1969, by Mrs Winifred Wedgwood. The AGM minutes of 1970 record a vote of thanks to Mrs Gillian Thomson (right), an active member, who was then leaving the area. 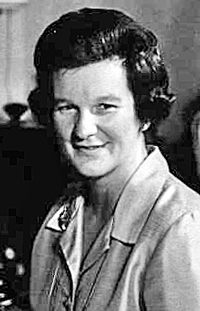 It was not until some years later, and only after persuasion from then club secretary Tony Wedgwood, that Mrs Thomson agreed to be named as the anonymous benefactor. Mrs Thomson was made an honorary member and continued to take an interest in the club from her home in Kelso. Thanks were of course also due to many members for the additional fund raising events undertaken during this time, including jumble sales, bring and buy, book sales and home garden events. Fay Lenore, a local actress and celebrity, opened a fund raising fete in 1969/70. The completion of the new clubhouse in 1969 allowed HLTC members to settle down to a period of consolidated play. The Scottish Sports Council assisted with the financing of a practice wall facility in 1973 and also supplied a grant for the funding of floodlighting the top two courts in 1976. However after a fairly quiet two decades for development, the beginning of the 1990s saw a decade of frenetic development. The professionalism of the officebearers at the time contributed greatly to funding applications being successful. The Scottish Sports Council, the Foundation for Sport and the Arts, Lawn Tennis Association loans, and the National Lottery all made major contributions to the latest developments, and Graeme Simmers, chairman of the Scottish Sports Council, opening the club’s new all weather courts in August 1992. In April 1996, Martin Bowie, project officer of the Lottery Sports Fund, presented a cheque to HLTC. The club had matched the Lottery Sports funding which allowed the newest and biggest ever development to proceed. This development was the erection of the club’s present two storey brick-built clubhouse and the covering of the three remaining courts with artificial grass. Then, in November 2000, honorary president Donald Fullarton officially switched on the lights after the completion of international standard floodlighting for all seven all weather courts. 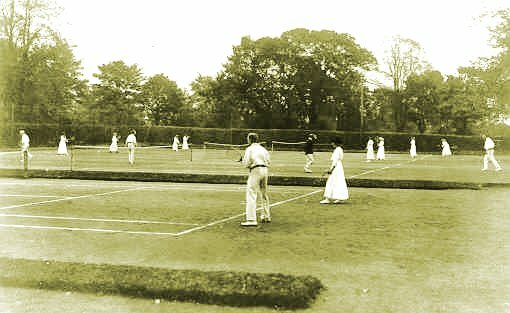 Originally facilities for members were tennis courts available for play during daylight hours from Monday till Saturday, on a playing surface of lawn and only from April till September each year. The transition to the present day facilities of seven all weather floodlit courts permits members play from 9am until 10pm, seven days a week, all year round. Minutes of 1925 record the planting of the privet hedge to replace the perimeter trees. In 1961 the installation of electric lighting in the then clubhouse was discussed and implemented, replacing elegant old gas fittings. Around 1990 there were two tarmac floodlit courts at the top and four blaes courts at the bottom. The single-storey timber-built clubhouse, opened in 1969, stood adjacent to Suffolk Street. A house and grounds on the north east corner of the block was at one stage offered for sale to the club, but was too expensive for the club to buy at the time and was replaced by maisonettes. With the courts today all artificial grass, no longer necessary is the ordering and delivery of blaes, the rolling of the courts, and the clearing and maintaining of lines. It is of interest that minutes of 1951 record that £70.4/- was raised from the sale of scrap lead which was previously the old lead lines — later replaced by plastic lines. However, artificial grass also requires maintenance with the regular laying down of sand and the sweeping of the courts. Net maintenance and replacement is always ongoing. Ground and clubhouse security has been a continual problem for the club since its formation. The present brick-built clubhouse successfully operates a swipe card entry system. A CCTV system has been operational in the clubhouse during the last few years. To date this has been the only system which has proved a successful deterrent to vandals. In earlier years coaching at the club was undertaken on a voluntary basis by senior members. However over the years the demand for coaching has dramatically increased. Affiliation of individual tennis clubs to the larger West of Scotland Lawn Tennis Association has always been a contentious issue to many club members, both in previous years and in the present, but it is important for coaching, club development and other reasons. A number of club members have served on the West committee over the years. Minutes of 1925 record affiliation being turned down, and it was not until 1929 that affiliation was finally agreed. Membership lapsed during the Second World War and resumed in 1948. The benefit of affiliation to individual clubs is immense, not only in coaching issues but also in matters of finance and development. In 1927, the voluntary services of Captain N.L.Bright were proposed to provide “instruction“. Captain Bright was not an authorised coach. The next year saw the engaging of Mr Robin Welsh, of 1 Western Terrace, Edinburgh, to provide instruction on Mondays and Tuesdays. The charge was 7 shilling and 6 pence per one hour lesson. The logistics of coordinating the present coaching programmes are horrendous, and HLTC can be justly proud of its present tennis and coaching structure which resulted in the club receiving both the West of Scotland and Scottish LTA Tennis Club of the Year awards in 2003-4, largely thanks to the efforts of head coach Steve Losh and coaching convener Ann Morison. 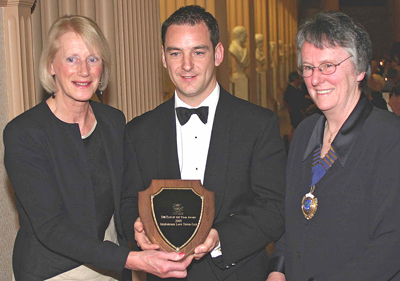 President Elspeth MacLean and Steve are pictured (right) receiving the Scottish award from the SLTA president at a ceremony in Edinburgh. The clubhouse displays a coaching board with named photographs of Ann and Steve and their team of qualified coaches. It also hosts two television sets and video facilities, and this allows training videos to be shown. Today there are coaching programmes for all levels of club play, including team training, senior intermediates, adult beginners, juniors coaching and performance squads, summer schools Mini Tennis — for which the club built two special courts in the summer of 2004. Coaching is also available to non-members at a slightly increased rate, and coaches also undertake individual coaching on demand. 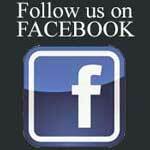 The ultimate social event in the history of HLTC has to be the Centenary Week celebrations of June 1984. A full programme of events took place throughout a wonderful week of weather, many of them in a marquee erected in the grounds on the site of the present clubhouse. 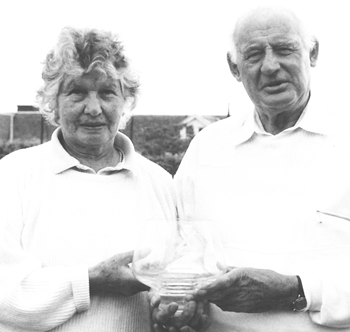 A finals day barbecue and prizegiving was held on the Saturday, when the trophies and prizes were presented by the late Mrs Winifred McKenzie (left), who had been a very enthusiastic HLTC player. On this occasion, she presented the club with a small silver salver which she herself had won during the golden jubilee celebrations in 1934. It was subsequently agreed that this salver was to be presented on an annual basis to a member whom the executive committee agreed had delivered exceptional service to the club, either on or off the courts. A photograph album and memorabilia from this centenary week, including a very amateur video of the main events shot by Donald Fullarton and Helensburgh Advertiser photographer and club member Stuart Cunningham, is held in the club archives. Finals day barbecues and annual dances have often featured in the history of the club, but demand for additional social events varies from year to year and tends to be cyclical. Ladies lunches have proved popular over the years. These provide enjoyable social tennis, combined with good food and conversation. Tennis evenings followed by supper, sometimes with gastronomic themes, have proved to be the most popularly supported social events in recent years. Past minutes over the years record numerous discussions on introducing an alcohol licence for the clubhouse, and this issue has been raised again in recent years. However, after many attempts to encourage members to socialise after play, it was proved there was not a demand for a permanent licence. The club continues to apply for special alcohol licences to support major social events. Introduced for the first time in 2003 was a week’s group tennis holiday in Mallorca organised by Head Coach Steve Losh. The club, throughout its history, has always maintained a healthy junior membership, encouraging and promoting tennis coaching and tournaments. Senior volunteer members undertook the junior coaching in the earlier years. More recently, Short Tennis classes for juniors were begun in the now-closed Clyde Community Education Centre in East Clyde Street, Helensburgh, by the late Will and Margaret Steuart-Corry (right). Mini-Tennis is an initiative promoted nationally by the Lawn Tennis Association, and HLTC was one of only seven clubs in the West of Scotland initially accredited as a Mini-Tennis Club. This scheme operates a simple, structured and flexible curriculum, and inspires juniors to develop a whole range of tennis skills. In the summer of 2004 two Mini-Tennis courts were built at the club, east of the clubhouse and north of courts 1-5, and a commemorative plaque was erected on these courts in memory of Mr and Mrs Steuart-Corry for their contribution over many years in promoting junior tennis. Present day championship events are much greater in number than in earlier years. The club now has a championship convener and committee to organise and coordinate all events. Sunday tennis was first discussed at committee in 1925 but was not implemented until 1937, from 2-6pm. In recent years many social tournaments, some including lunch, have been played on Sundays. Ladies leagues were created for the first time in 1951/52. Today the club has sufficient members interested in competitive play to operate a number of adult and veteran teams as well as junior teams in the West of Scotland Leagues. It is essential that members are kept informed of club activities. One of the earliest tennis reports is recorded in the Helensburgh and Gareloch Times of 22nd July, 1885, and outlines a tennis match played at Helensburgh against Dumbarton. Since then, reports have been submitted to all the local papers and in the past year to local news websites. Over the years newsletters have been used to provide information to members, and today members receive news updates and a periodic newsletter by email. A club website was introduced several years ago, and in May 2009 and January 2018 had major upgrades and redesigns.